Roy was born and raised in Indianapolis, Indiana. As a high school student, he lived for the limelight of fame on the basketball court and the benefits of his earned reputation when he stepped off the court. After graduating from high school, God encountered Roy in such a powerful way that he waved goodbye to his “personal fame” and then began a relentless pursuit of Christ. Despite the absence of a musical background, Roy Tosh found himself filled with a message that poured out of his soul through Hip Hop music. Roy has opened for Grammy winning recording artist Lecrae, Jeremy Camp, Andy Mineo, and more. 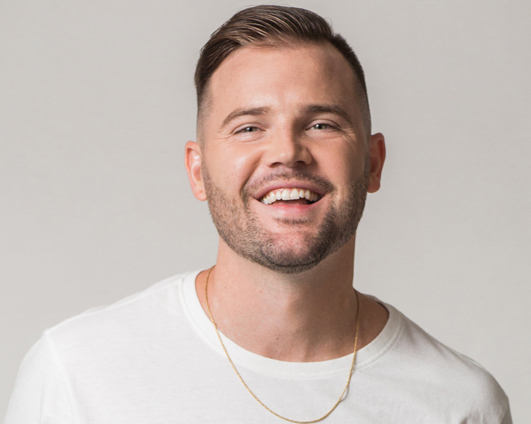 He has also shared stages with Pillar, Jordan Feliz, Britt Nicole, Social Club, Kutless, KB, Tedashii, This’l, Benjah, V. Rose, Clayton Jennings, and more . Tosh serves as director of a non for profit organization, “CFI Ministries,” that he started with his wife which aims to reach “just 1 more” with God’s love through media and live events. He has worked beside many organizations such as FCA, CRU, Young Life, and has ministered at a variety of churches, camps, and youth groups across the globe. His music videos have been aired on GodTV, JCTV, UPTV, as well as other television networks. Roy now resides in sunny Orlando, Florida with his wife and son. In 2014, Andy Mineo & Benjah helped Roy go through a rebranding process which resulted in his current artist name “Roy Tosh” (a combination of his birth names). Music mentor and nationally known recording artist “Benjah” has helped him develop a melodic side to his music, stretching him beyond being just a rapper. In 2014, Tosh released a free album called “The Revert” that featured Benjah, Deraj, TJ Pompeo, & Black Knight. The album has been downloaded over 9,000 times and has over 130,000 listens! His latest album, “Death Before Love,” features Benjah, Canton Jones, Beckah Shae, Alex Faith and more as well as the hit singles “Dream On” and “Never Die.” Tosh’s music video for “Dream On” was recently picked up in stores at Foot Locker as well as other television networks, and has been played on 50+ radio stations reaching across the globe. It currently has over 1.5 million views on Facebook alone. “Death Before Love” was nominated in three different categories matching CCM powerhouse Toby Mac by New Release Today’s 4th Annual “We Love Christian Music Awards.” The nominations included ‘Best Urban/Rap Album of the Year’, ‘Best Collaboration’ for his song “Abba” with Beckah Shae, and ‘Best Indie Artist/Group of the Year’! For more information or to book Roy Tosh for your next event, fill out a form here or email RoyToshBooking@gmail.com.